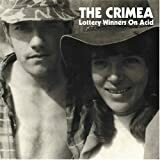 Carrying on where The Crocketts left off, The Crimea were also screwed by the industry, this time by Warner Music Group. The more produced sound of the releases under Warner isn't awful, but on the whole I much prefer the material produced before and since. In 2007 The Crimea were one of the first reasonably well-known bands to release an album – Secrets of the Witching Hour – for free download, which is still available, and Loop A Loop featured in a Trident gum advert the year after. This US taster EP features infectious early recordings, including my favourite rendition of Bombay Sapphire Coma. Everyone's got one "long hot summer" slab of music, and these tracks are mine. If you don't want to take my word for it, the title song was played quite a lot by John Peel.